Building better futures for our Tribe’s children is a key priority for the Coquille Indian Tribe. Because we know our own people’s well-being is inseparable from the well-being of our neighbors, we look for ways to help and encourage young people throughout the community. Success in school starts with a strong foundation. The Coquille Indian Tribe’s Head Start Program, open to any child age 3 to 5, promotes development of cognitive and social skills. Breakfast, lunch and snacks are provided. Enrollment for the next Head Start class is advertised each year from June to September. Enrollment is limited to 20 students. Coquille Tribal members are given first priority, followed by other Native American children and non-native children. The Coquille Indian Tribe’s communitywide College and Career Fair is an ideal way to for teens to explore their future. 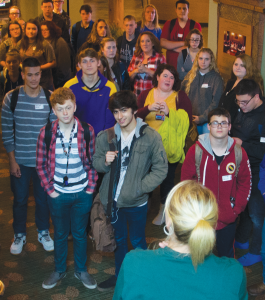 At the 2016 event, more than 300 local high school students met local employers as well as representatives from Oregon colleges and universities. The fair is free to eighth-graders through high school seniors from all Coos County schools. 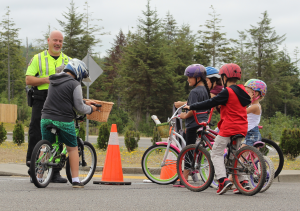 The Coquille Tribal Police Department wants every child to ride safely. So each year the department sponsors a bicycle safety “rodeo” at our Kilkich Reservation near Charleston. The rodeo typically takes place on a Saturday in August. (Watch for announcements.) The event is free for kids of all ages – Tribal members or not. Each child should bring a bicycle or non-motorized scooter – and of course that all-important helmet! The event focuses on safety and rules of the road, but we make sure it’s fun as well. Lunch and prizes also are on the agenda. 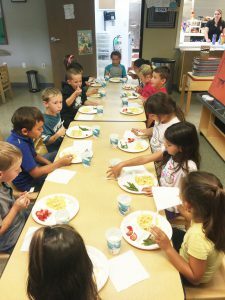 Kids burn a lot of energy during summer vacation, so the Coquille Indian Tribe partners with the U.S. Department of Agriculture to provide tasty, nourishing meals. The Summer Food Program is a free service to children and youth of the whole community. The friendly staff of the Tribe’s Learning Center at Kilkich welcomes all kids age 18 and under. No application is required – just walk in. The program operates Monday through Friday, except holidays, throughout the Coos Bay School District’s summer break. Breakfast is served from 8:30 to 9:30 a.m. Lunch is served from 11:30 a.m. to 12:30 p.m.
All meals meet USDA nutrition standards. If your child has a food allergy or other special dietary needs, your health-care provider can fill out a form requesting food alternatives. The Coquille Indian Tribe is an equal opportunity provider. The Coquille Tribal Learning Center is at 591 Miluk Drive. Each year, local fourth-graders learn about the culture and history of southwest Oregon’s Native people from the people who know it best. The Coquille Tribe cooperates with the Coos History Museum and the Confederated Tribes of Coos, Lower Umpqua and Siuslaw Indians to present fascinating local insights. Presentations take place in the memorable setting of the Coquille Tribe’s Community Plankhouse.